Curtains Blinds Wallpaper Singapore: How To Choose Curtains For Your Home? How To Choose Curtains For Your Home? Curtains are the ideal way to bring that finishing touch to a room. Used extensively in the world of interior design they can transform the look of a room whether you want classical elegance or contemporary chic. However, when choosing curtains, there are a number of tips that can be used if you are to find window dressings that not only perfectly frame your windows but also enrich the design of your home. On the marketplace today there are thousands of different styles and types of curtains available in all of the colors of the rainbow and a plethora of different styles. Customers are offered the most expensive made to measure variants as well as cheaper ready-made, off the shelf products. Also, the range of curtain poles and tie backs allow homeowners to make a true spectacle of their windows. 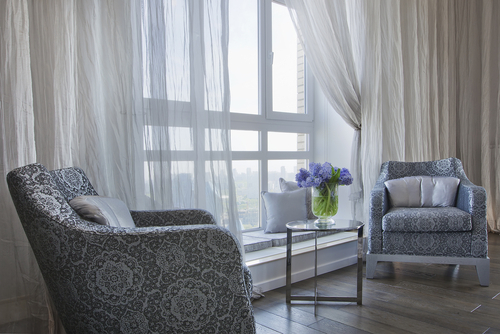 The following are some essential tips for choosing the ideal curtains for your home. -When deciding on fabric, it is important that you match the design and colors with your soft furnishings and decor. This will allow you to create a uniform look in the room. -Classic designs and fabrics are the ideal way to create a classical look whereas funkier, brighter colors can be used to emphasize modern, contemporary styles. -While the choice of curtains is an important decision it should not be made lightly, it is vital that you consider all of the other items that will be placed in the room such as lampshades, cushions, tablecloths and bed sheets. -The amount of light you let into the room should also be considered. For a bedroom thicker fabrics are advisable as these will block light whereas in dining rooms or sitting rooms lighter materials are perfect for allowing both light and air into the room. -If you are buying curtain fabric rather than the ready-made variety, it is a good idea to use any leftover fabric to upholster cushions so that they complement the curtains. 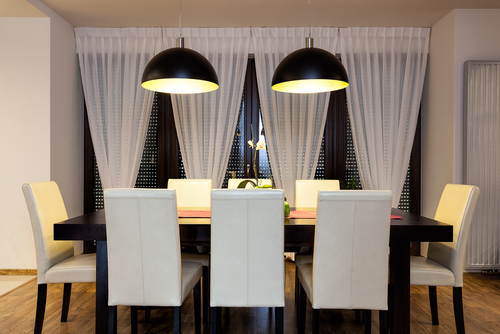 The color of your new window curtains should typically match that of your walls. They need not be the same color, but the shade you choose should go well with the existing paint. If you choose one that is too much of contrast, it might make your home interiors look gaudy. Most homeowners tend to go in for sober-coloured walls when redoing their house. Beige, earth shades, light browns, and whites are the most common choice. Keep in mind that lighter shades will make your rooms look more spacious. You will be spoilt for choice when it comes to curtains designs. You will find several kinds of plain-colored curtains; ones with heavy, complicated prints; some with small prints and much more. While choosing the color is the first step, the right curtain design also plays an important role in enhancing your room. If you have a small to the medium-sized room, it is better to go in for simpler, smaller designs or prints. If you have a spacious room that you are presently decorating, you could go in for larger prints. Typically, larger prints make the rooms look smaller. To make your home look a tad more creative, opt for different curtain sets for every room. This will give a unique theme to every room while making your home look comfortable. Today, you may even opt to buy curtains online. Online shopping norms are easy and flexible, allowing you to sit in one place and go through a host of designs and choices. Do you want to have double curtains? Double curtains are usually set up with the rubber backed layer against the window and a lacy film on the second track to let in light, but enhance privacy through the daylight hours. Lacy curtains provide a little bit of shade, but not much. You will need a special track for double curtains. Do you want to have blinds as well as curtains? If you prefer to have a blind rather than the rubber backed curtains for privacy, you will need to ensure that the curtains fall into two sections, one on each side. This leaves a gap in the middle that makes it easier to pull down the blind. 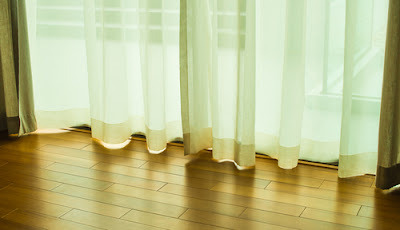 If you prefer to have a single length of curtain that goes right across and is not on a runner, then you will need to get blinds that can be pulled up and down by a cord at the side. In rural properties, or areas where the windows of the bedroom do not look onto a public path or road, you might prefer to just have the see through curtains so that you can admire the view when you wake up or the stars when you go to bed. In this case, simple rod pocket curtains will suffice; you could even make them yourself. When choosing curtain material for the room, you may want to stick with white, cream or beige colors. It is not always possible to match the color of the room exactly - and you may want to repaint a different color later on, so the curtains will not match it then. You can perhaps choose a pattern that incorporates the color of the room, but many people feel that bedroom curtains should be plain rather than patterned to give a more restful feel to the room Patterned material can seem to make a room feel too busy, and so disturb the sleep. Most curtains are pleated or gathered at the top and have curtain rings or runners attached that go onto the curtain track. This makes it easier to draw them close and to open them. Rod pocket curtains are difficult to move along the curtain rod and so are usually left in place. They are often tied to one side with an attractive ribbon or piece of self-material.